Integra Optics CEO David Prescott stands on the wing of a Japanese Zero replica in his hangar at the Albany International Airport. The 1952 Harvard Mk. IV, better known as TORA I, was built by the Canadian military and transformed into a replica of the Japanese Zero by 20th Century Fox. It was filmed for the big screen fighting American planes during WWII, and was more often than not on the losing end of those Hollywood battles. It is also, more specifically, a replica of a Japanese plane that flew in the second wave of attack on Pearl Harbor. More than 2,400 Americans died at the Hawaiian naval base on Dec. 7, 1941. “As a kid, I grew up watching the Black Sheep Squadron and I watched this plane get shot down every week,” Prescott said of the late 1970s television series featuring a group of misfit fighter pilots under the command of Major Greg “Pappy” Boyington. The meticulously kept plane was owned by Douglas Jackson, of Jackson and Associates, and for 22 years he flew it in airshows across the country. Jackson also encouraged people to get a close up look at plane to get a bit of its story, and by extension learn a little about our country’s entry into WWII — one of the most significant events in our history. 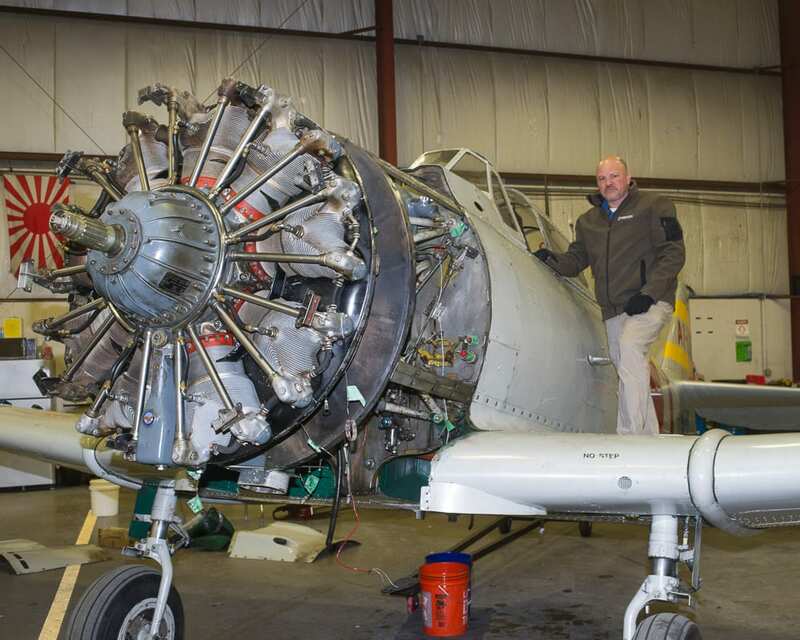 Prescott, a licensed pilot, a historic aviation enthusiast and U.S. Navy vet, now houses the plane at the Integra Optics hangar at Albany International Airport and plans to use it in much the same fashion as Jackson, who recently died of an aggressive form of cancer. The plane is currently getting a new 600-horsepower Pratt & Whitney motor and should be airborne again by next spring. The motor will, of course, have a shiny 2018 penny wired it. It is more for tradition today, when information is readily available online, than the original purpose served decades ago of telling mechanics at remote airfields when the engine was installed. But the plane is all about tradition. This summer it will be on the airshow circuit reenacting the storied dogfights between American and Japanese pilots that have captured imaginations for decades. When he owned the plane, Jackson corresponded with descendants of Japanese fighter pilots who flew the real Toras in WWII. He passed on that research to Prescott to help tell the story of the plane, and educate the next generation on the lessons of WWII. While other pilots will fly the airshows, they won’t fly all of them. Prescott, will have some fun too. “It’s a light, aerobatic plane and it’s fun to fly,” he said. But, the former Navy nuclear engineer last based at the Naval Nuclear Power Training Unit in Ballston Spa, said owning the plane is not all fun and games. It also serves significant practical and symbolic purposes. When not flying in airshows, it will sometimes be on display at the Empire State Aerosciences Museum in Glenville so people can get a close up look at it and learn a bit about its history. It fits in nicely there, Prescott said, and it’s by coincidence. The Japanese Zero this airplane is modeled after flew off the storied aircraft carrier Akagi to bomb Pearl Harbor. The museum has a 33-foot model of that ship on display, so with the plane there, visitors will see a plane with the same markings of the ship it flew off on the day we got pulled into WWII. Basically, Integra Optics, a company Prescott founded in 2007, “helps network engineers, designers and managers around the world build out new fiber optic networks, extend the value of their existing networks and maintain uptime with the most reliable transceivers and fiber optic components available,” according to its website. More basically, it provides the ability of fiber optic technology to bring usable data to televisions, phones and computers around the globe with reliable, fast hookups to the internet. So, what does a high-tech company working with fiber optics have to do with old airplanes. At the beginning of WWII, the U.S. did not have an aircraft that could compete with the likes of the Japanese Zero, so U.S. aviation engineers had to work double time to produce an aircraft that could outmaneuver and outperform the Zeros.